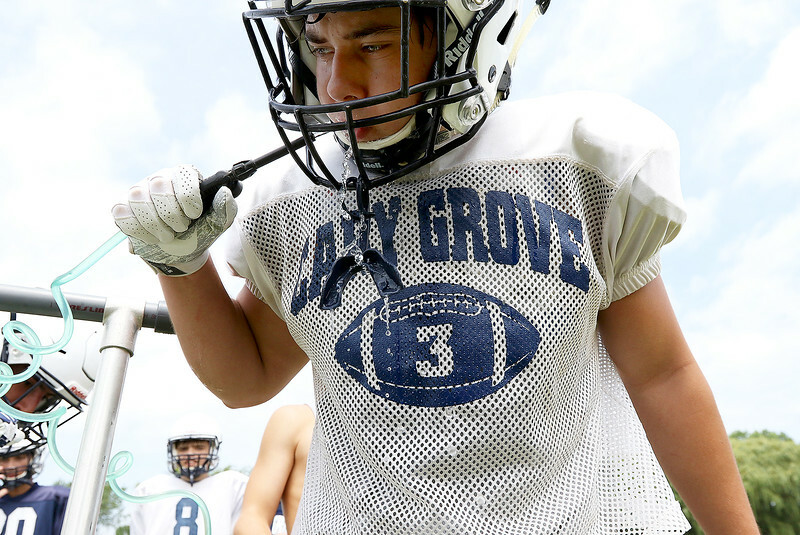 H. Rick Bamman - hbamman@shawmedia.com Cary-Grove's junior fullback / linebacker Cole Eggebraten adjusts his pads before the start of summer practice drills at Cary-Grove High School on Monday, July 3, 2017. 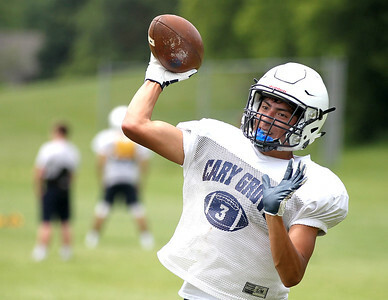 H. Rick Bamman - hbamman@shawmedia.com Cary-Grove's Daniel Battaglia thows the ball back to assistant coach Mike Walston during summer practice on Monday, July 3, 2017 at Cary-Grove High School. H. Rick Bamman - hbamman@shawmedia.com Cary-Grove offensive linemen Brett Groves (left) and Addison West run drills during summer practice on Monday, July 3, 2017 at Cary-Grove High School. H. Rick Bamman - hbamman@shawmedia.com Cary-Grove offensive lineman Brett Groves blocks during a play during summer practice on Monday, July 3, 2017 at Cary-Grove High School. 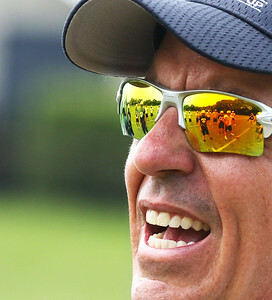 H. Rick Bamman - hbamman@shawmedia.com Cary-Grove's Matt McQuade drinks during a break at summer practice on Monday, July 3, 2017 at Cary-Grove High School. 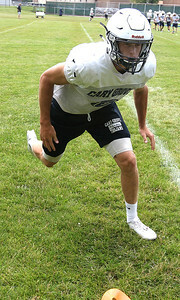 H. Rick Bamman - hbamman@shawmedia.com Cary-Grove quarterback Quinn Priester runs a drill during summer practice on Monday, July 3, 2017. 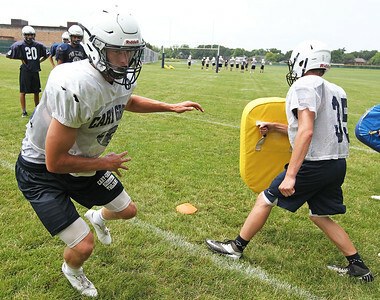 H. Rick Bamman - hbamman@shawmedia.com Cary-Grove quarterback Quinn Priester (left) bounces off blocker Evan Taylor during summer practice at Cary-Grove High School on Monday, July 3, 2017. H. Rick Bamman - hbamman@shawmedia.com Cary-Grove head coach Brad Seaburg leads his team during summer practice on Monday, July 3, 2017. 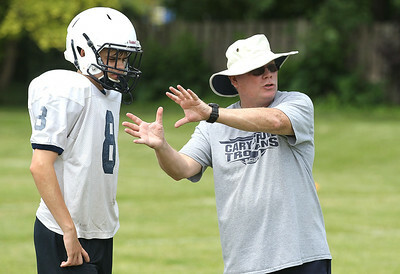 The 2017 season will be Seaburg's seventh year as head coach at Cary-Grove and 17th year overall at the school. H. Rick Bamman - hbamman@shawmedia.com Cary-Grove head coach Brad Seaburg (left) watches summer practice on Monday, July 3, 2017 at Cary-Grove High School. 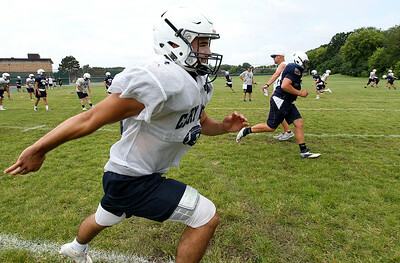 H. Rick Bamman - hbamman@shawmedia.com Cary-Grove's Running back/linebacker Max Skol runs drills during summer practice on Monday, July 3, 2017. H. Rick Bamman - hbamman@shawmedia.com Cary-Grove assistant coach Don Sutherland works with running back / linebacker Max Skol during summer practice on Monday, July 3, 2017. 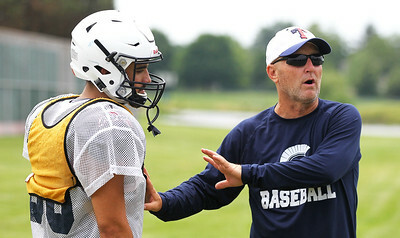 H. Rick Bamman - hbamman@shawmedia.com Cary-Grove assistant coach Mike Walston works with Nick Frezza during summer practice on Monday, July 3, 2017. 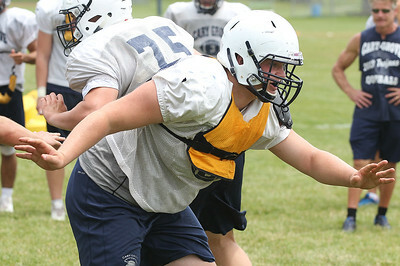 H. Rick Bamman - hbamman@shawmedia.com Cary-Grove offensive lineman Addison West blocks durring summer practice on Monday, July 3, 2017 at Cary-Grove High School. Cary-Grove's Matt McQuade drinks during a break at summer practice on Monday, July 3, 2017 at Cary-Grove High School.